All credible pathways to net zero emissions by 2050 include technologies to remove and permanently store carbon dioxide, including carbon capture, utilization and storage (CCUS). 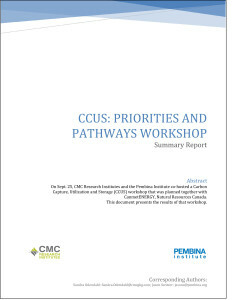 Since the early 2000s, Canada has been at the forefront of CCUS project development. With an eye to developing a robust CCUS industry in Canada, the Pembina Institute and CMC Research Institutes with support from CanmetENERGY hosted a one-day expert workshop in September 2018. Participants assessed the opportunities and barriers to CCUS development and deployment in Canada, and worked to define the action necessary for Canada to play a leadership role in the emergence of this trillion dollar global industry.